Zero Waste means waste prevention, through conscious consumption and conservation, and reducing trash sent to landfills, by reusing, recycling and composting. Zero waste helps preserve our environment by moving away from a “disposable economy” and taking responsibility for our use of resources now, so that future generations can enjoy a healthy, sustainable planet. Why is Zero Waste important? For every can of garbage at the curb, there are 87 cans worth of materials that come from extraction industries—such as timber, agriculture, mining, and petroleum—that manufacture natural resources into finished products. Source: World Resources Institute. Most plastics take 100’s of years to degrade in the environment while releasing toxins that affect humans and wildlife. The way we produce, consume and dispose of our products and our food accounts for 42% of all U.S. greenhouse gas emissions. Disposing of our trash at the Rio Rancho landfill costs County residents more than $20,000 every month, which only includes hauling and disposal fees. The landfill will soon be filled to capacity, resulting in the creation of another landfill, increased disposal fees, and hauling costs. Zero Waste creates ten times more jobs per ton than landfills. Our current consumption rates are unsustainable. We need 1.7 Earths to sustain our current rate of resource extraction. If everyone lived like Americans, that jumps to 4.8 Earths. Los Alamos has many opportunities to divert discarded materials for recycling and reuse, but most of our waste (over 75%) still goes to the landfill. County residents send more than 5,000 tons of trash to the landfill each year, over ¼ ton from each and every resident! How will we get to Zero Waste? REDUCE! The most effective way to reduce waste is through conscious consumption choices. Most of the waste associated with a product occurs before you buy it. With every choice we make, each of us has the power to create change and make progress in reducing waste. Look at what you buy, and see what you can reduce or eliminate. Rethink: Do I really need to purchase this item? Could I use something I already have? Could I find a used item? Refuse: Say No to single-use straws, bottles, bags, etc. Don’t accept freebies (pens, etc.) you don’t need. Reexamine: Could I find this product with less packaging? Could I substitute something that produces less waste? Could I grocery shop with a list to avoid buying too much food? Reflect: Before sending something to the landfill, ask: What can I do with this item besides sending it to the landfill? Can anyone else use it? How can I avoid making this waste in the future? REUSE! Reusing, repairing, re-homing and composting the discards we can’t avoid should always be considered before sending waste to the landfill. Invest in well-made products, and bring reusable bags, water bottles, cups, etc. to avoid single-use items. Check second-hand sources for used items before buying new. Buy products with recycled content. RECYCLE RIGHT! 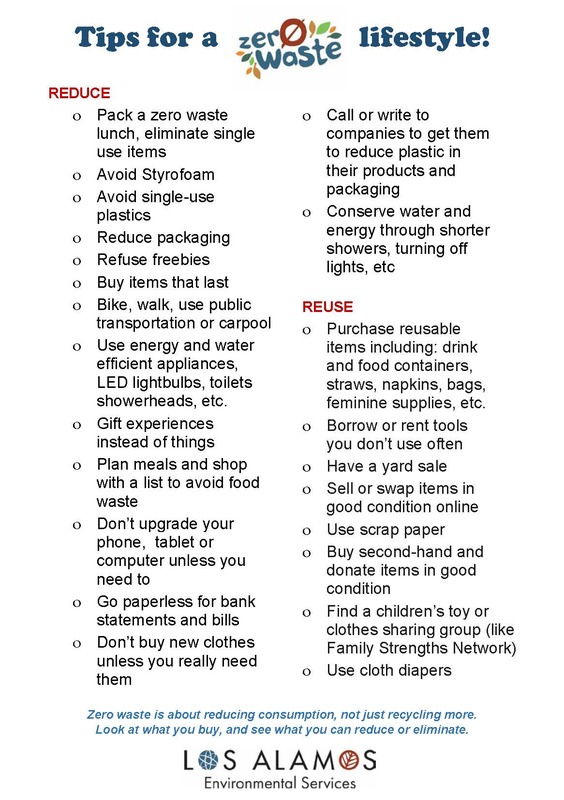 Recycling is still a great thing to do….If you do it right! Putting non-recyclables such as plastic bags, Styrofoam, and food-contaminated items into your recycling bin can result in a whole batch of material being landfilled. 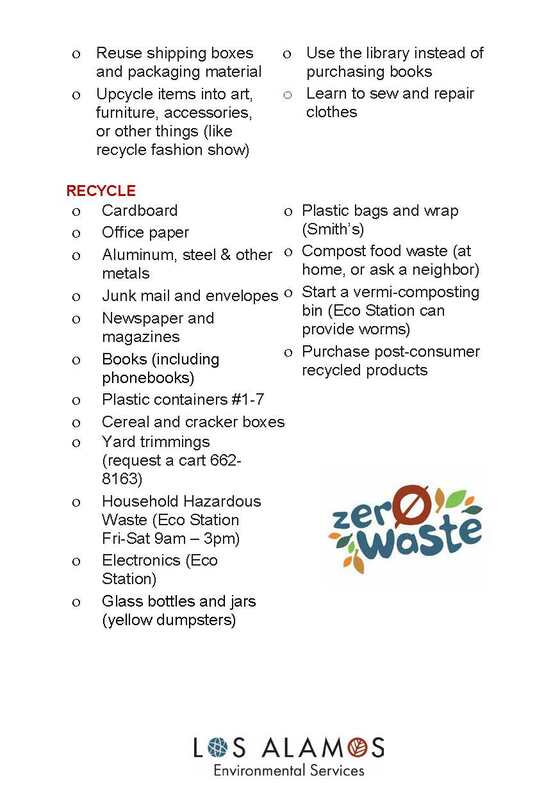 Click here to see what should be recycled, and how. Use the yard trimmings roll the cart to recycle your yard waste into mulch and compost. Led by teacher Megan Lee, the Chamisa Elementary School's Green Team (an environmentally-minded club comprised of fourth-grade students) successfully deployed a one-week zero waste lunch event in April 2017. More than 110 students participated in bringing waste-free lunches to school. Prizes were given daily and a punch card recorded their participation. To promote this event, the Green Team scripted and created a video of how to pack a waste-free lunch and presented it to the students. The County's Environmental Services Division received a grant from the New Mexico Environment Department to remake the video with PAC-8 and run it at our local movie theater for one year. Kudos to all involved - great job!